The Purdue University Department of Computer Science Adventures in Computer Science Summer Camps for middle school students introduces campers to computer applications and careers. Technology and computers are becoming more common place in K-12 classrooms, yet students rarely have the opportunity to explore available applications and uses. Middle-school aged students have become experienced at navigating the Internet and applying various educational software packages, but the field of computer science offers so much more. The Adventures in Computer Science Summer Camp was developed by the Purdue Department of Computer Science in order to expose middle-school aged youth to the wide spectrum of computer science concepts. Students will learn to use new computer applications, identify the many places computer science is present, and gauge their interest in the field. 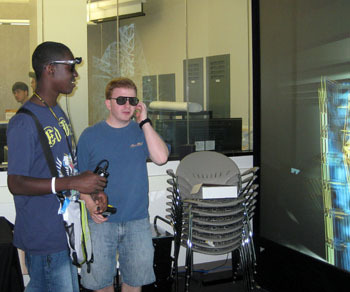 The camp also identifies the diverse career opportunities available to a computer scientist. Specific objectives include exposure to careers in computer science, increasing problem-solving skills, building awareness of the importance of math and science in preparing for a career in computer science, and increasing awareness of our K-12 outreach services that are available. Additionally, a second level camp has been developed for students wishing to continue the pursuit of computer science knowledge. Campers will be housed on Purdue’s campus in the air-conditioned Hillenbrand Hall and registration fees cover all meals, “fun night,” student admission to the recognition luncheon, and all materials. Activities are led by Mindy Hart, Purdue University Computer Science K-12 Outreach Coordinator and certified teachers. The Beginner Camp runs June 14-17, and will focus on programming using Lego Robotics and Alice programming languages. Beginner campers should be comfortable using a computer. Registration for the Adventures in Computer Science Summer Camps is open. Space is limited, and parents who register their child before June 1 will receive a discount. Parents may go online to register their 6th, 7th, or 8th grader for the beginner camp, or register students in grades 7, 8, or 9 for advanced camp. For more information about the Adventures in Computer Science Summer Camp, contact Mindy Hart at 765-494-7802.